There are two methods of using heat to grill: directly or indirectly. These two methods are very different and understanding when to use each method is important in making sure that your dish turns out just right. Direct heat is when you put your dish directly over the fire and indirect is when your dish is offset from the source of the heat. The indirect method cooks your meat through residual heat that is trapped inside the grill. As a basic rule, grilling any small cut of meat should be done using the direct grilling method and any large cut of meat should be done indirectly. Cooking with the direct method is the most common way to grill and is a more traditional method. 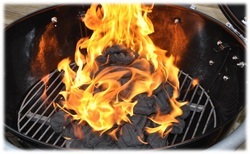 Items that are less than 2 inches thick like steaks, burgers, hot dogs, shrimp, fish fillets, and chicken breasts should be cooked with the direct method and can be positioned directly under the flame of your grill. Cooking with the indirect method is less common and should be used only for large cuts of meat like beef brisket, hams, roast, whole chicken or whole turkey. 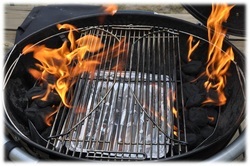 Indirect grilling always requires the lid to be closed in order to capture the heat inside the grill and cook the meat that isn't directly over the flame. Positioning the meat offset from directly under the flame allows the meat to cook all the way throughout the full cut. If you put a large cut directly over the heat like the direct method, it would just burn the bottom side of the meat and the inside would still be raw. Cooking indirectly requires a longer period of cooking time due to the large portion of meat and the residual heat.